For The 2017-2018 challenge, we use an advanced arm and lift to grab, lift, and place the Glyphs, A.K.A grey and brown blocks, in the Cryptobox. 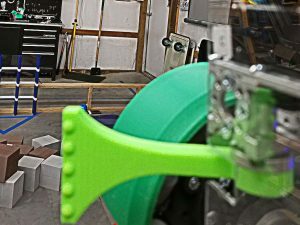 Grabber/Arms – The grabber is quite the piece of machinery on our robot. Our grabber was based on team 1986 Team Titanium Tech’s 2017-2018 robots arm. The Arm uses a servo to flip the grabber to pick up blocks at a high speed. We knew we would need a more efficient arm to be able to be more successful this year so we made a brand new grabber. It uses 1 servo to turn/flip it to grab glyphs faster, and 4 more servos attached to a plastic sheet with special 3D printed “hands” attached to grab the glyphs. The glyphs can be grabbed from both sides and corners for more efficiency. Hands – The hands are 3D printed arms, they are made to connect to metal bars to make it so they can both grab glyphs from the sides and corners, works well for our autonomous and our drivers. Grabber and Lift –The grabber is attached to our lift mechanism, where the lift will lift up the grabber so the grabber can do its job. Final Words – In final words, this year’s arm was made completely custom with influence from other teams to made a great and strong arm that works fast, steady, and efficiently.